There are three reasons why healthcare organizations need a HIPAA compliant hospital paging solution. Naturally the first of these is compliance with the Healthcare Insurance Portability and Accountability Act (HIPAA). The second reason is to reduce costs, and the third is to implement a solution that takes advantage of modern technology to increase productivity. HIPAA compliance is a big issue. Pager systems are only HIPAA compliant provided that no unencrypted identifying details of a patient are sent across a pager network. For healthcare organizations still using unencrypted pagers, the cost of implementing a HIPAA compliant hospital paging solution by changing from unencrypted to encrypted pager messaging would be colossal. Even maintaining an existing non-compliant pager system – and not using it to transmit protected health information (PHI) – can be expensive. A recent study conducted by HIMSS Analytics found that large healthcare organizations were spending on average $179,000 per year for pager systems in hospitals – an average of $8.40 per device, per month for a typical hospital with 100 beds or more. The third issue – taking advantage of modern technology to increase productivity – is something that many legacy pager systems are incapable of doing. Back in 2013, CNN Money described pagers as “archaic communication technology” and claimed that pagers were costing the healthcare industry billions of dollars each year. As part of the research conducted to compile the HIMSS Analytics report, researchers spoke with senior executives responsible for the selection, purchase or management of pagers in their organizations. Among the most popular answers to why healthcare organizations persevered with pager systems, “perceived reliability” came top of the list. Despite this, countless surveys have indicated that medical professionals do not use pagers but personal mobile devices in the workplace. According to American Nurse Today, “67% of hospitals reported in 2013 that their nurses used personal devices to communicate and support their workflow”; while, in 2012, the Manhattan Research/Physician Channel Adoption Study found that 87% of doctors used a smartphone or tablet in the workplace. All the time senior executives believe they do not need a HIPAA compliant hospital paging solution, their medical professionals are likely communicating PHI in breach of HIPAA, their healthcare organizations are paying for “archaic communication technology”, and they are erecting a barrier to opportunities that would reduce costs and increase productivity. Healthcare organizations can resolve their communication issues with secure messaging – a HIPAA compliant hospital paging solution that is cost-effective when compared against pager systems, and offers the opportunity to take advantage of modern technology in order to reduce costs and increase productivity. Secure messaging works by a private communications network being created, that authorized users can access via secure messaging apps. The apps work across all operating systems and can be downloaded onto any desktop computer or mobile device – giving healthcare organizations the opportunity to implement cost-saving BYOD policies. Using the HIPAA compliant hospital paging solution, medical professionals can send and receive messages, share images and – when integrated into an EMR – access test results and receive EMR alerts on their mobile devices with no risk to the integrity of PHI. The secure messaging solution also reduces the number of devices that medical professionals have to carry with them at all times. TigerConnect’s HIPAA compliant hospital paging solution uses AES and SSL encryption to ensure the integrity of PHI both at rest and in transit. All activity on the healthcare organization´s communications network is monitored, and access reports and audits are produced in order to assist administrators with the compilation of risk assessments. 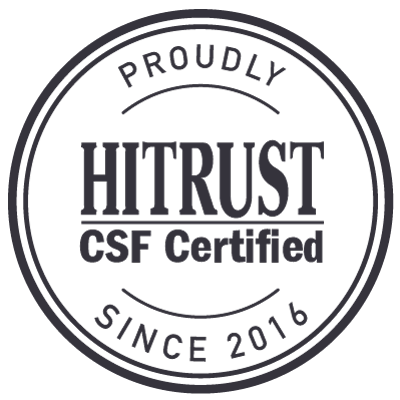 Safeguards exist to prevent the accidental or malicious unauthorized disclosure of PHI. Message lifespans can be attached to communications in order that are automatically removed from a user´s device, while a time-out feature ensures that PHI cannot be accessed by an unauthorized individual when a desktop computer or mobile device is left unattended. Further safeguards enable administrators to remotely wipe all content from a secure messaging app, and to PIN-lock the app if the device onto which it has been downloaded is lost, stolen or otherwise disposed of. No PHI can be forwarded outside of a healthcare organization´s communications network, saved to an external hard drive, or copied and pasted. TigerConnect’s HIPAA compliant hospital paging solution provides medical professionals with the speed and convenience of mobile technology, while delivering enterprise-grade security to healthcare organizations. Productivity is increased due to a reduction in phone tag, while 100% message accountability is assured. Features such as group messaging foster collaboration, accelerate patient admissions and hospital discharges, while community healthcare professionals can communicate patient care needs from their mobile phones without having to return to their offices to escalate patient concerns. 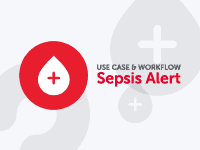 When integrated with an EMR, the documentation of patient care can be shared between multiple medical staff – releasing physicians from data entry duties – and EMR alerts can be sorted by priority to streamline workflows. According to research conducted by Tepper School of Business at the Carnegie Mellon University in 2015, the integration of a HIPAA compliant hospital paging solution with an EMR can also reduce medication errors by 30% and reduce patient safety incidents by 27%. The cost of using TigerConnect as a HIPAA compliant hospital paging solution compares favorably with the costs of maintaining a non-compliant pager system mentioned previously. TigerText is implemented in more than 5,000 medical facilities throughout the country, with the average cost to healthcare organizations less than $5.00 per user, per month. Furthermore, our HIPAA compliant hospital paging solution has no set-up or installation costs. TigerConnect operates through a cloud-based “Software-as-a-Service” platform. This means that there is no expensive hardware to purchase or complicated software that requires the resources of an IT department to deploy. 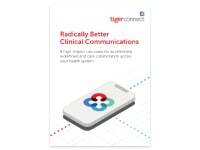 Medical professionals will require minimal training on the use of the secure messaging apps due to them having an interface similar to commercially available messaging apps such as iMessage and WhatsApp, while the reporting capabilities of TigerConnect’s solution eases the burden of HIPAA compliance on system administrators. 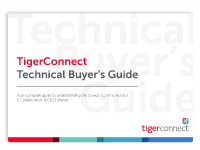 TigerConnect is the leading provider of secure messaging solutions for healthcare organizations of all sizes. Included among the 5,000 medical facilities that use TigerText to comply with HIPAA and increase productivity are four of the top five for-profit healthcare systems in the country. TigerConnect has proven itself to be a reliable and versatile HIPAA compliant hospital paging solution that includes many advanced features to accelerate the communications cycle within a healthcare organization and, currently, our servers process more than ten billion secure messages per year. If you would like to find out more about the benefits of our secure messaging solution, please do not hesitate to contact us and request a demonstration of TigerText in action. Our team will answer any questions you may have about TigerText and how we can help reduce costs in your healthcare organization.